Moist soils. These were found growing in a bog. 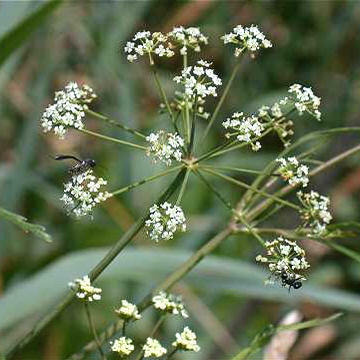 In minerotrophic wetlands can be found growing with Asclepias incarnata, Bidens cernua, Calamagrostis canadensis, Campanula aparinoides, Thelypteris palustris, Eupatorium perfoliatum, Impatiens capensis, Leersia oryzoides, Lycopus uniflorus, Sagittaria latifolia, Scirpus cyperinus, Typha latifolia. Newfoundland west to AK, south to PA, WV, KY, KS, and OR, and at high elevation to VA.
Herbaceous perennial with slender stems to 1 m. Leaflets linear, up to 5mm wide with coarse teeth, all growing from stem. Veins of the leaves end in the sinuses rather than the teeth. Bulblets form in the axils of the upper leaves. Flowers white, petals 5, in umbels. Highly poisonous. Not as common as C. maculata. Overall rather delicate in appearance.